I love trying out some nail, but I'm not very patient, so I can't be bothered sitting around waiting for my nail varnish to dry so I can move onto the next step or just get on with my day. Although I love both Seche Vite and Ciate Speed Coat for how quickly they dry my nail varnish, both of these went off half way through the bottle and I've had to throw them away. I've ordered Sally Hansen Insta-Dry as it's considerably cheaper than the other two, so even if it does go off half way through I won't be quite as bothered, but this hasn't arrived yet. 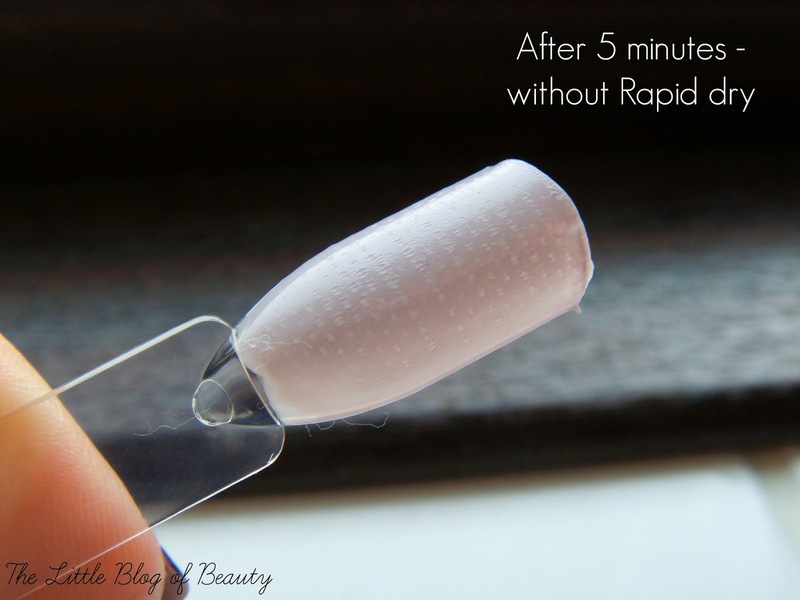 I received Elegant Touch's Rapid dry for nails a while back in one of my Glossyboxes, but I haven't really paid it much attention so far. 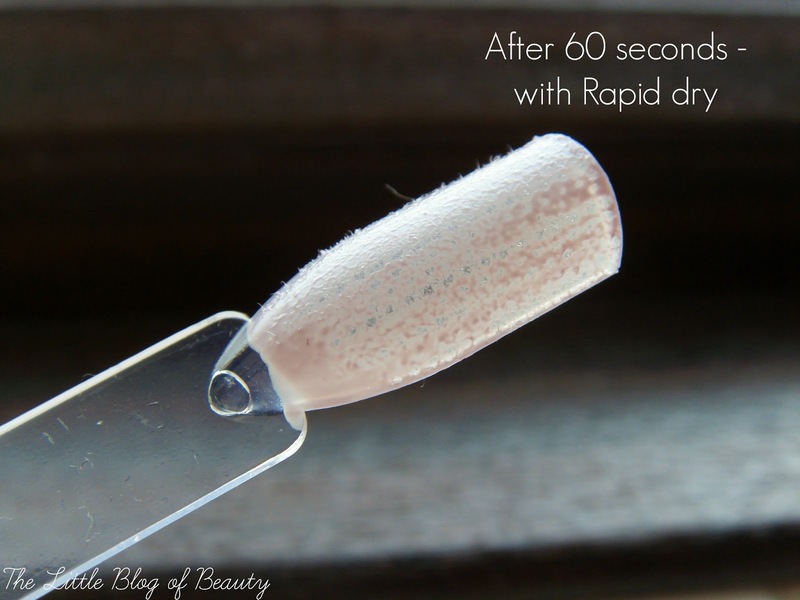 So while I'm waiting for Insta-Dry to arrive (and hopefully be the answer to my quick drying and long lasting prayers) I thought I'd put Rapid dry for nails' claim of drying nail varnish in 60 seconds to the test. 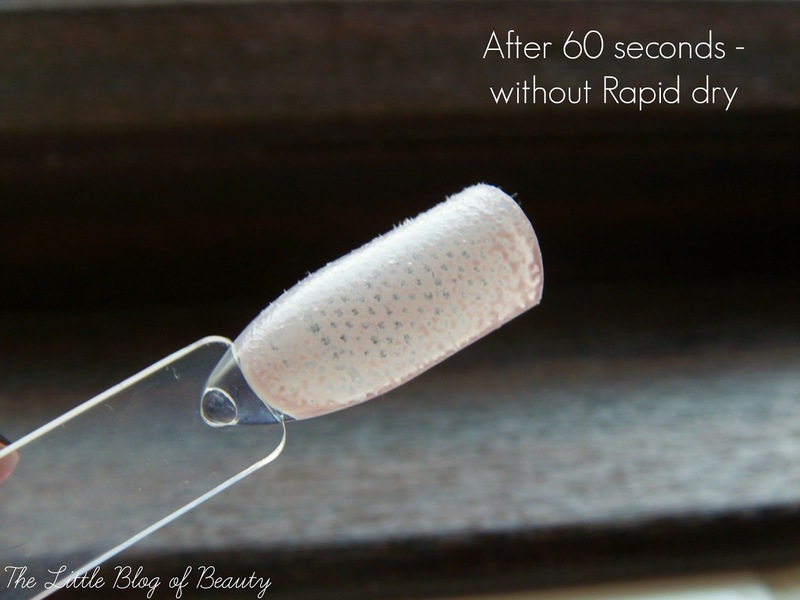 Rapid dry for nails' claim is that nails will be touch dry in 60 seconds, but to be honest I'm never quite sure what this means! I assume it means that if you touch the varnish gently it won't still be wet but as it's 'touch' dry it's not fully dry and it's likely that it might smudge or pick up an imprint? As the claim is just to be touch dry in 60 seconds I'm pretty sure the fabric I'm using for the test will leave an imprint in both nails after 60 seconds, so I decided to add in a five minute test as well to give the nails chance to dry properly. For the 60 second test I painted both nail sticks (do they actually have a name?) with two coats of the same nail varnish. I then left one to dry naturally and the other I sprayed with Rapid dry for nails. I left them both for 60 seconds before lightly pressing a small piece of fabric onto each nail and then removing it. Apologies for having to add my brown window edge into the pictures but it's the only way I could get my camera to focus properly on the nails as it didn't like it when I held them up in front of a white background. As you can see from the pictures above neither nail came off particularly well. There's a little more nail varnish left behind on the nail that was sprayed with Rapid dry, but it may also be that I didn't press the fabric down as evenly on that one. For the five minute test I did exactly the same as in the 60 second test but left both nails for five minutes before I pressed the fabric onto each one. In this test the nail that wasn't sprayed with Rapid dry was still imprinted by the fabric, much more lightly than in the 60 second test, but you would still be able to see this and I don't think applying a top coat over the top would smooth this. The nail that was sprayed with Rapid dry was only very slightly imprinted by the fabric and I think if you applied a top coat over the top this would probably conceal this quite well. The 60 second test probably did push Rapid dry a little too far as the claim is touch dry (not smoosh a piece a fabric onto it dry! 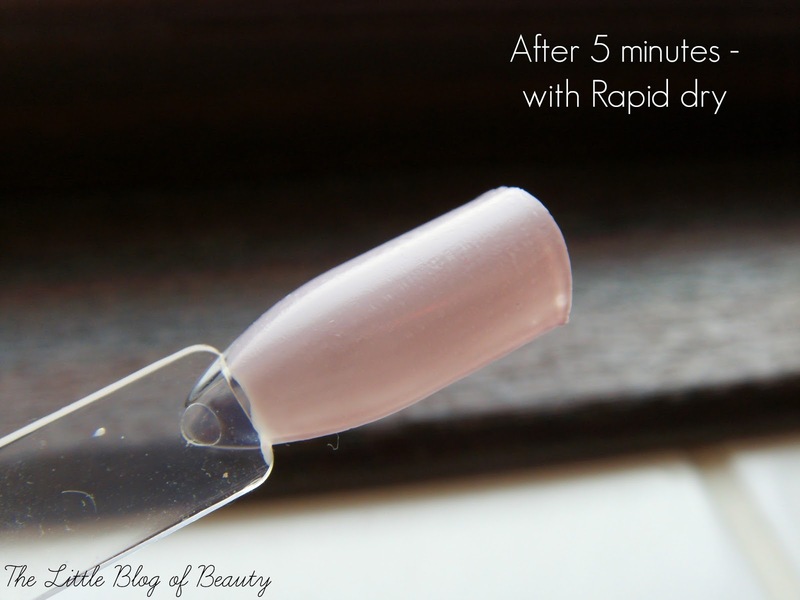 ), but the 5 minute test shows that Rapid dry does appear to dry your nail varnish a little bit quicker than just leaving it to dry on it's own. However I don't think the difference in drying time is enough to make me switch over to using this when I could just apply a quick drying top coat over the top (even if the base colour is only touch dry) and the whole nail could be completely dry and smudge and imprint proof within five minutes. 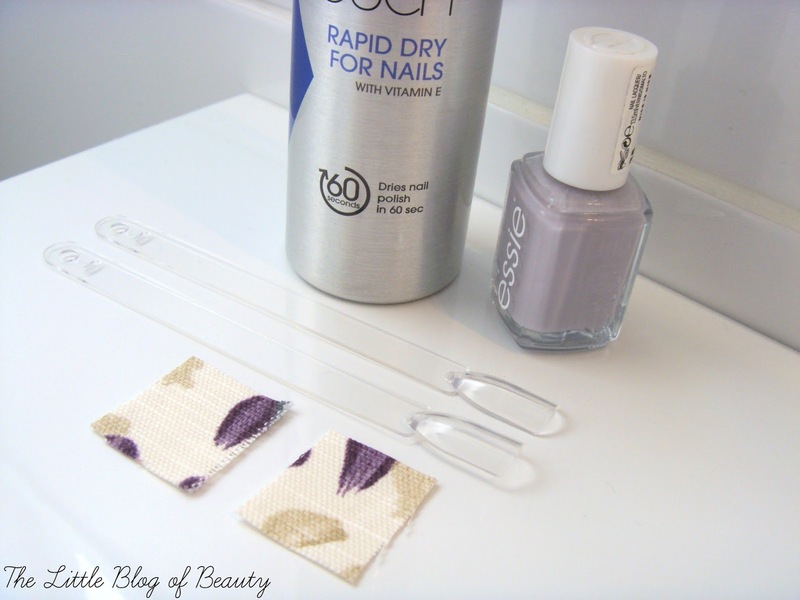 Do you use anything to dry your nails quickly? I'm glad I stumbled across this post, I always fall for these sort of gimics - especially because I absolutely hate it when my nails smudge!! Would love it if you could take a look at my blog and even follow!